Want a piping hot slice of cheesy goodness? Sarpino's Pizzeria is the place for you. 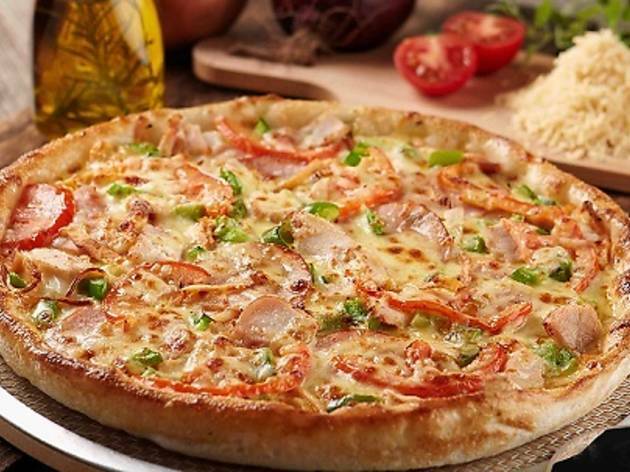 Founded in 2001 in Canada, the chain restaurant now stakes its claim as the third largest pizza group in Singapore, with outlets at Jalan Kayu, Paya Lebar, Balestier, Jalan Pemimpin, Bukit Timah, Jurong East and more. Here, the dough (with hints of garlic, salt and olive oil), tomato sauce (which features 14 secret spices and herbs), yoghurt sauce and garlic butter (which is used to dust the crust of the pizza for added flavour) are all handmade from scratch every day to ensure freshness. Choose from delectable gourmet offerings ($18.80-$28.80) like Ranch Style Chicken, with yoghurt sauce, chicken strips, turkey ham, turkey bacon, green peppers and tomatoes, or get the spicy Mexicana topped with ground beef, red chilli, peppers, tomatoes and jalapenos. They've also got classic pizzas like the Tropical Hawaiian and Pepperoni, or go for their house special if you fancy a mix of turkey ham, pepperoni, mushrooms, olives and shrimps. If you're looking for an affordable option, they've got the 'buy one get one free' special ($25-$35/two) for pizzas like Margherita, Teriyaki Chicken, BBQ Chicken, Pepperoni, Aloha and more. Plus, look out for side orders like cheesy bread sticks ($6.20), garlic bread sticks ($3.90), BBQ, sweet chilli or cayenne rub chicken wings ($8.90/eight) and salads, among others. 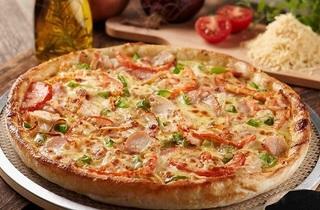 You can choose to dine in at the various outlets or get the pizza delivered straight to your doorstep.